A dog. A bug. A walk around the block. From this simple premise comes one of the great picture contemporary picture books — and, while we’re on the subject, great picture books, period. With a spare, clean design and plenty of humor, Mark Newgarden and Megan Montague Cash’s Bow-Wow Bugs a Bug (2007) is a pleasure to read and to re-read. Working in a cartoon minimalism reminiscent of Ernie Bushmiller, Crockett Johnson, and Otto Soglow, Newgarden and Cash provide only the details required to tell the story, and omit all else. The bug is a black dot, the fence a series of long-stemmed “Y”s, and Bow-Wow himself an economy of lines and curves. Since both foreground and background are iconic, Newgarden and Cash cannot guide readers by (for instance) relying on the difference between an iconic dog and a more detailed rendering of a fence: instead, they direct our attention through movement. Just after leaving the house, the bug rounds the corner, with Bow-Wow in pursuit. 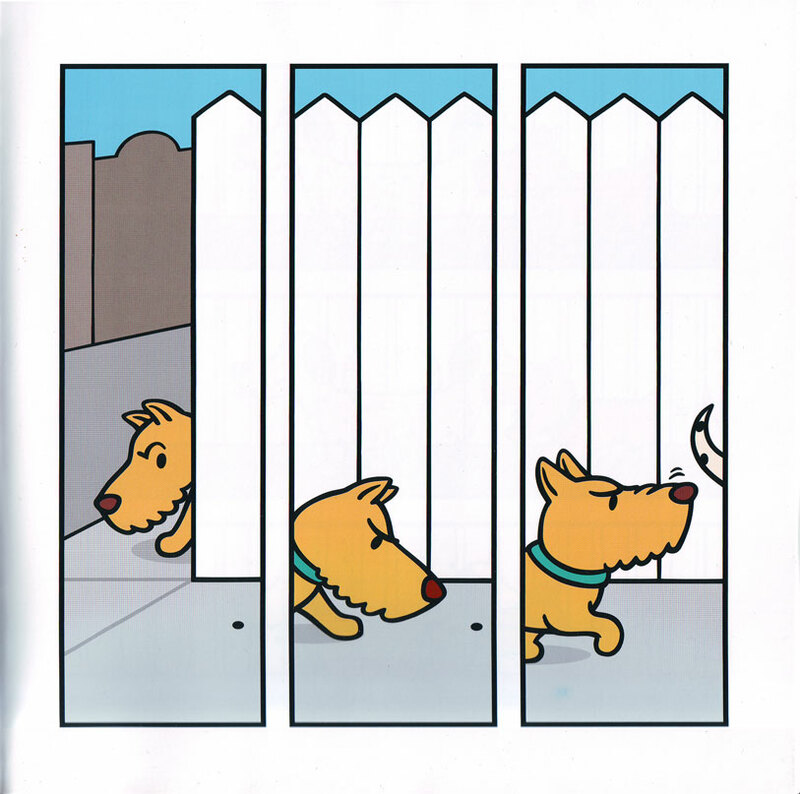 If you were to draw a line mapping the movement of Bow-Wow’s head across three panels, you’d see that it moves in a shape that resembles a flattened “v.” In the first panel, as the bug moves to the right, Bow-Wow’s head emerges from behind the fence’s edge, at left; this is its highest in the sequence. 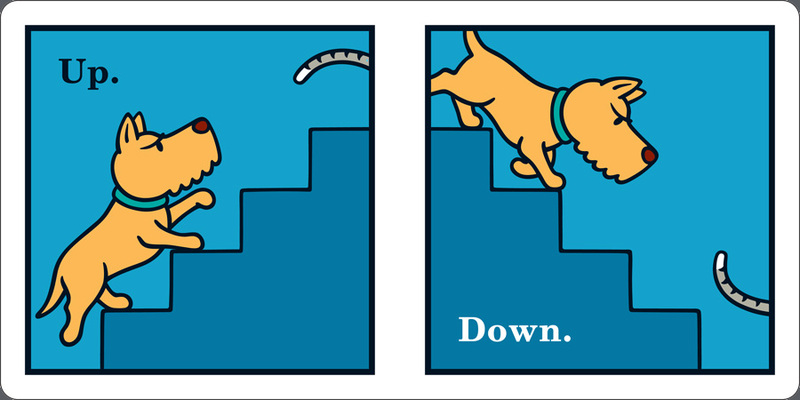 In the next panel, Bow-Wow’s head dips to its lowest place in this trio of panels, as his gait traverses the fence’s vertical lines. 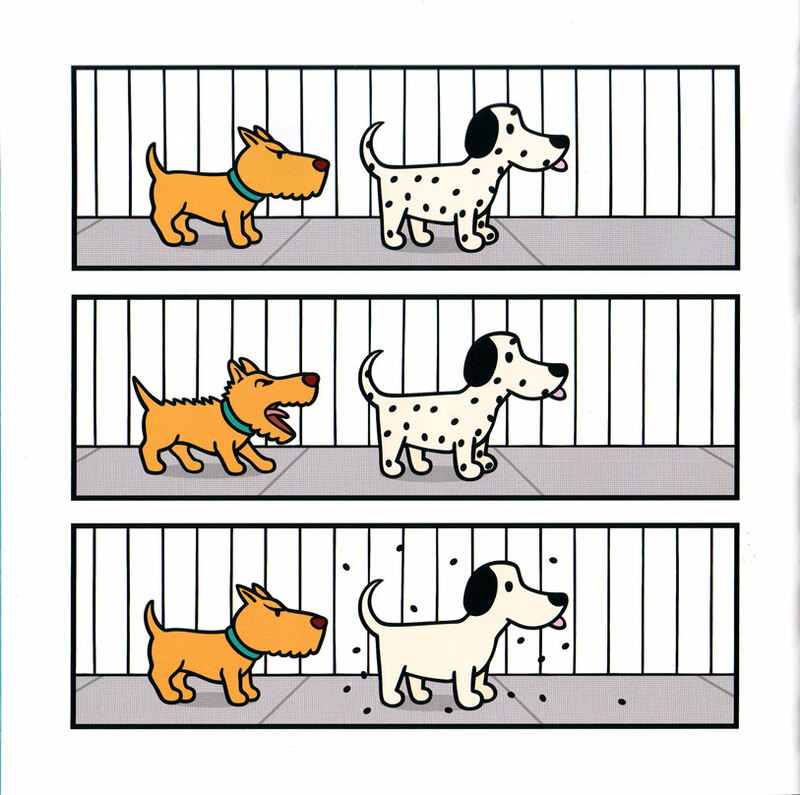 In the third and final panel, the head rises up to sniff the other dog’s tail. Turn the page, and the book’s delightful sense of the absurd emerges. Irritated that the bug is hiding among the Dalmation’s spots, Bow-Wow just barks those spots right off. 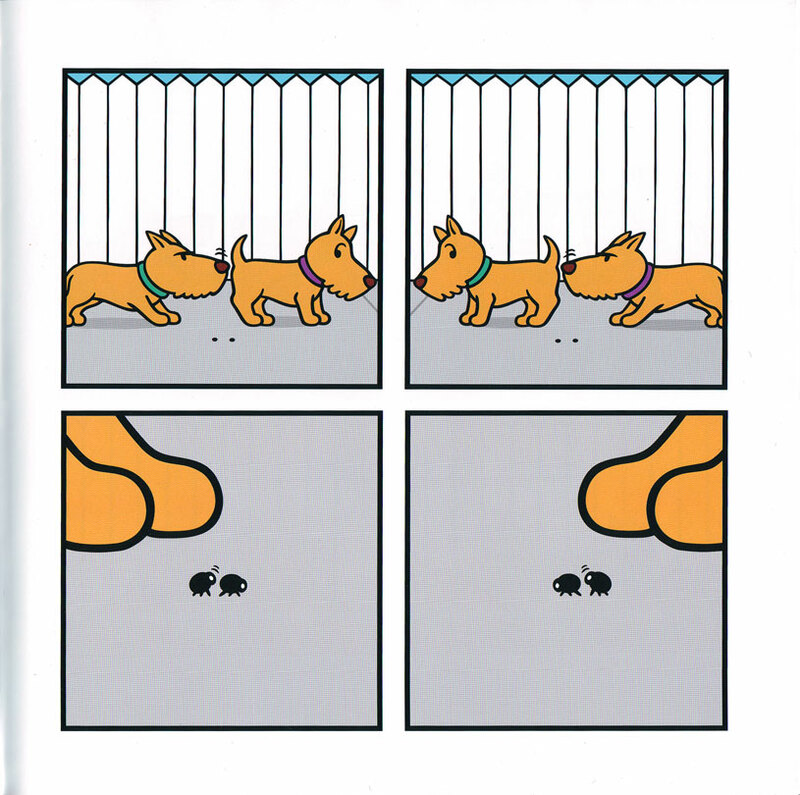 Later, when Newgarden and Cash’s protagonist meets another terrier who is also following a bug, the dogs sniff each other… and so do the bugs. Over the next three pages, the dogs undertake an increasingly elaborate ritual of greeting… and the bugs do the same. Hilarious. Also wordless. In its absence of words and iconic style, the book recalls those (mostly) word-free minimalist gems The Little Man with the Eyes (Crockett Johnson) and The Little King (Otto Soglow), the latter of which Newgarden paid tribute to in his The Little Nun strip (1988-1993). Its debt to comics raises the question of genre. I’ve been calling it a picture book, but a more accurate claim would be to say that, using the production values of the picture book, Bow-Wow Bugs a Bug uses narrative techniques from comic strips, silent film, and flip books. I could just sidestep the genre question by calling it a graphic narrative, but Bow-Wow Bugs a Bug is closer to the picture book genre than the six Bow-Wow board books: Bow-Wow Naps by Number (2007), Bow-Wow Orders Lunch (2007), Bow-Wow Attracts Opposites (2008), Bow-Wow Hears Things (2008), Bow-Wow’s Colorful Life (2009), and Bow-Wow Twelve Months Running (2009). 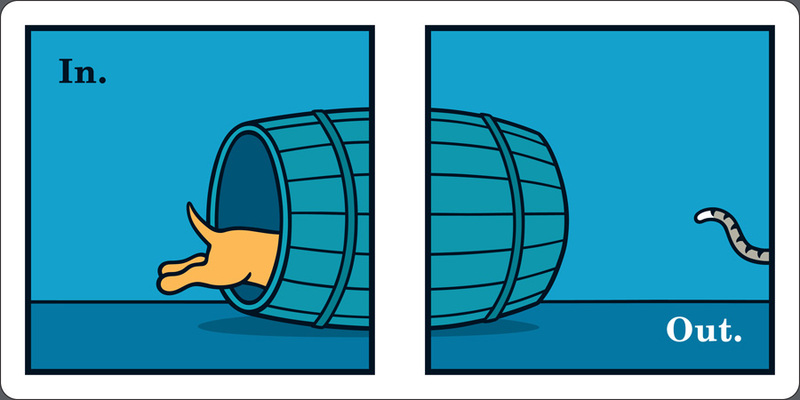 With one panel per page, they lack the frequency of juxtapositions common to a comic or to Bow-Wow Bugs a Bug. Their narratives rely more upon the graphic strategies of picture books. Less surreal than Bow-Wow Bugs a Bug but just as delightful, the board books are concept books that also have a narrative. Bow-Wow Attracts Opposites, my favorite of the group, explores the concept of opposites, while our canine protagonist chases a cat. As you can see, Bow-Wow is a dog of few words. Though the board books all have text, it is kept to a minimum. But that economy of both language and image is precisely why these books work so well. Small-scale narrative gems, the Bow-Wow stories are masterpieces of economy. They keep it simple, but are not simplistic. Indeed, students of graphic narrative should study these — and Johnson, Soglow, Bushmiller — to learn how to pace and structure an illustrated story. In restricting themselves to few words (in the board books) or none (in the picture book) and succinct iconic artwork (in both), Newgarden and Cash make their limited palette feel limitless. Some good news for Bow-Wow fans. Two new picture books are in the works: Bow-Wow’s Nightmare Neighbors and Bow-Wow’s Curious Comics. I was doing some digging on Wikipedia, and discovered Mark Newgarden is the inventor of those disgusting (and hilarious) Garbage Pail Kids trading cards from the 80’s. They were horrifying, my parents hated them, and naturally I loved them. It’s interesting to see he has range!